Manchester United have sacked their coach after a disastrous season, which means they'll miss out on Europe's lucrative Champions League next season. David Moyes was appointed less than a year ago, when the club's most successful manager -- Alex Ferguson -- retired after 26 years. Under Ferguson, the team had won the richest national soccer league for 13 of the last 21 years, and used the steady flow of broadcast and matchday revenue to invest in players and build a global commercial brand. However, poor form on the pitch this year is leaving Manchester United (MANU) without honors in domestic league and cup competition, and leaves the club facing a year without Champions League TV revenue -- worth some $50 million alone. Financial concerns may well have forced the hand of the team's American owners, the Glazer family, who also owns the Tampa Bay Buccaneers. The Glazers borrowed heavily against Manchester United assets when they bought the club in 2005. The cost of servicing those debts -- together with a huge wage bill -- eats up 70% of revenue. "This is a highly indebted firm which leaves little financial room for disappointment," said financial analyst Louise Cooper. "Frankly, the Glazers could not afford to wait for Mr Moyes to step up to the job." Failing to qualify for the top competition in Europe could also have a knock-on effect on sponsorship renewal talks with Nike (NKE) -- the second single biggest source of revenue after English TV broadcasts -- and ticket sales. The Telegraph reported recently that the Glazer family had agreed to a 25% cut in ticket prices for Europa League matches at the club's home ground if the team qualifies for the second tier European knockout competition. Investors appear to be hoping a change in coach will mean improved financial fortunes. 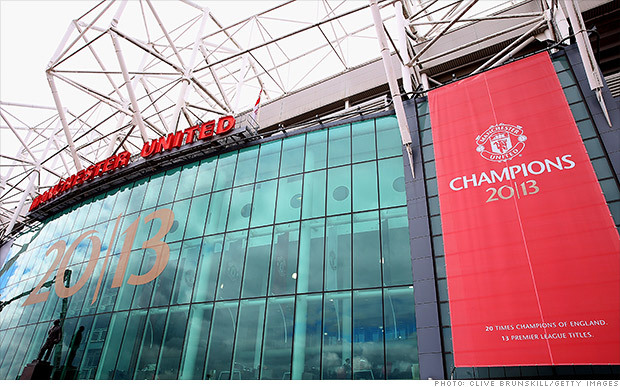 And after two years of pre-tax losses, Manchester United can use the help. Shares had rallied recently on talk that Moyes would be forced out, gaining more ground Tuesday.